"The term “hospice” (from the same linguistic root as “hospitality”) can be traced back to medieval times when it referred to a place of shelter and rest for weary or ill travelers on a long journey. The name was first applied to specialized care for dying patients by physician Dame Cicely Saunders, who began her work with the terminally ill in 1948 and eventually went on to create the first modern hospice—St. Christopher’s Hospice—in a residential suburb of London. "By the 1950s, social trends were changing and most people died in hospitals rather than in their own homes. This change reflected the growing number of treatments available in hospitals. The medical profession increasingly saw death as failure. Cancer was the most feared diagnosis. Physical pain afflicted at least three quarters of cancer sufferers and appropriate painkillers were rarely used. Morphine was considered addictive and too dangerous." In 1967 the very first modern Hospice was opened in Sydenham, London. "Led by Dame Cicely, St Christopher’s set out to discover practical solutions and to disseminate them widely. There were, of course, other hospices before St Christopher’s. These hospices were oases of dedicated nursing care for the terminally ill, but they were not what we now think of as modern palliative care. In contrast, St Christopher’s was committed to education and research, as well as excellence in clinical care. In 1969 Dr. Elizabeth Kubler-Ross wrote her groundbreaking book On Death and Dying. Based on interviews with 500 dying patients, it is their experiences which Kubler-Ross distilled into the five stages of death and dying: denial, anger, bargaining, depression, acceptance. These are the emotional stages one usually experiences in the loss of a loved one. Les and I experienced shock at this diagnosis, anger about former medical treatment which we feel has brought us to this point, and we jumped right on to acceptance. This was possible because of my previous experiences with death and dying. As a former Hospice volunteer I know from personal experience the one major mistake people make when faced with a life limiting or terminal diagnosis is allowing denial to drive their thoughts and choices. This shuts one off from seeking assistance at a time one needs it most. Too often people wait too long to contact Hospice when it is the first contact a terminally ill patient and their family needs. I have seen Hospice care dramatically improve the quality of life for patients to the point they were able to leave , having gained insight into how to engage in better self-care, and how to actually live and enjoy life in the face of terminal illness. But Hospice is not just for the terminally ill; it also exists to help immediate family and care givers, providing support for those who so desperately need it in the face of overwhelming emotions, endless care giving, and consistent feelings of helplessness and sadness. There are generally two types of Hospice care programs: inpatient where the terminally ill person is provided a room in a hospice setting which provides on-site medical care and around-the-clock service; outpatient which brings hospice into the home of the patient, allowing those who choose to do so, to die at home in familiar surroundings. What does all this mean for me and Les? It is Les' wish to die at home, on our boat, with me by his side. We shared this with our GP, and she referred us to Rennie Grove Outpatient Hospice. We had a wonderful initial meeting with Nurse Jenny who was at first surprised and then relaxed about our very frank and straightforward approach to death and dying. Now that we are hooked into the local Hospice program, a Hospice nurse visits us at home every other week and we have one phone number to call at any given moment should a need arise--it matters not if it is morning, noon, middle of the night, weekends, bank holidays or Christmas. The 24 hour a day reception service takes our information and a Hospice nurse calls us back within ten to fifteen minutes. They liaise with our GP and the local Visiting Nurses, who come and see us on the weeks in between the Hospice nurse visits. What this means for Les is that his pain levels are consistently monitored by the nurses--some of whom can prescribe meds and others who contact our GP or the Hospice Palliative Care Specialist physician to ensure Les has always got the appropriate medications for his situation on hand. Les feeling good and working on a project! 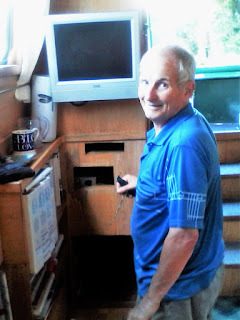 It means that when Les felt as though his legs were going to give way in the shower, a call to Ian Rennie and a chat with a nurse resulted in a hospice occupational therapist visiting our boat, measuring our bath and ordering a shower seat which fits our tiny bathroom and our needs like a good glove. It means that when Les' stoma blocked up last week at 3:15 am, leaving him in pain so acute all he could do was cry and moan, I had someone to call. A Hospice nurse came straight away and gave him an injection of Di Morphine to take the edge off his pain. After conferring with her, I called an ambulance which took Les to the local A & E.
While I was standing outside the A & E making a phone call, I overheard the conversation of another woman on the phone. Her father-in-law was in the A & E. He has terminal lung cancer. I overheard this woman talking with her sister-in-law: "...yes, yes and the doctor told me they had dad stabilized now and he could go home but this happens every time. He cannot breathe so we bring him in, and they stabilize him with the nebulizer and let him go home where his condition deteriorates and we are right back where we started." I waited for her to hang up and apologized for listening in on her conversation. I told her why we were here at the A & E and then I told her about Rennie Grove Hospice because the medical staff of the hospice could no doubt stabilize her father-in-law at home and save them all much grief and anxiety. I hope she took my advice and called them. This was a perfect example of how and when hospice can step in and make life better for a terminally ill patient and their loved ones. Les being carried off the boat by paramedics. It means that once Les returned home again, the Visiting Nurse came and checked in on us. In recapping the situation for her, she realized that Les did not get the dose of 12 hour timed release Morphine from the evening before this event, because it was trapped in the blockage, and he didn't get the dose I gave him the following morning during the event because he vomited it up. So he went for 24 hours without the consistent amount of analgesic required to allow him to function comfortably. She suggested that rather than upping his dosage after this event, we continue on the same dosage and see how Les did, which was good advice. Once life settled down again, Les functioned superbly on the current pain dosage--as along as his body delivered it. the longer we can keep Les comfortable on lower dosages of Morphine, the better off he is. It means that when the Hospice nurse checked in with us the following week, she had been brought up to date by the Visiting Nurse and after thinking about Les' situation, she asked if she could contact our GP and discuss changing Les' pain meds from timed release Morphine capsules to a Morphine patch which would deliver Les' needed pain meds even if his stoma blocked again. It means that since we don't have a car, and I am using crutches on long journeys due to the Osteoarthritis in my right knee, that we have only had to step foot in a pharmacy or a GP surgery only once in two and a half months. For me it means I don't feel like the entire weight of Les' care is sitting on my shoulders alone. Given that Les' health can turn on a dime this is very important to me. Any time I have a question or concern, I can contact Ian Rennie Hospice and someone will return my call right away to discuss my concern and help brainstorm a remedy or provide me with and answer which is so comforting since Les' health can change in a heartbeat these days. If I needed time away from caring for Les, the Hospice program would find a volunteer to sit with him while I went out. As a former hospice volunteer I have washed dishes, made beds, and fixed a meal for overwhelmed care givers and family who simply did not have one ounce of energy left to lift a finger other than providing care to their dying loved one; I have organized drawers and closets for a weak terminally ill patient so things suited their present circumstances better; as a former hair stylist, I have cut the hair of patients too weak to travel to a salon; I have painted finger and toe nails, helped very weak patients eat, visited weekly with lonely patients who had no family; I have sat with people who were taking their last breath in this life and whose family was too far away to be there at the time so they did not have to die alone. I have sat and drunk coffee with bewildered family members while explaining that death is hard work for the dying. It only looks easy for those of us at their bedside. In actuality the dying person who lies quietly not moving or speaking may be re-visiting memories, shuffling through life experiences, settling things in their hearts and minds, and dealing with extremely deep emotions to which we on the outside are not privy. Their spirit is also beginning to disconnect from its body and this is very hard work. We are born into this world in these bodies which grow with us and carry us through our lives. We take our bodies for granted until they no longer work as we expect and we too often confuse our bodies with our essential self. This is why quiet and peace is crucial for someone on the very cusp of dying. Every time their room is packed with visitors and people are talking away to them, the dying spirit is called back to its body and the whole process has to begin again. This is one reason why people often choose to die late at night or in the wee hours of the morning when no one else is around. For us the involvement early on with Hospice means things like Do Not Resuscitate (DNR) orders and where Les wants to be when he dies have been discussed and agreed upon. In the final analysis Hospice means we have time to focus on living well each day instead of focusing only on death, because these issues have been discussed, addressed, agreed upon and will be dealt with appropriately as they arise. So what does living look like with the knowledge death is just around the corner? For us it means I am looking ahead only far enough to anticipate what Les might need to feel comfortable in the months to come when he is boat bound and can no longer walk. The dinette will be made into his bed so he can lie somewhere light, airy and sunny. We are looking at getting a couple of those round mirrors used to see approaching traffic in tight spaces. These mirrors mounted at the right angle above the dinette would allow Les to see the passing parade of boats and people. The dinette area will allow Les to see visitors and watch telly. It means I don't think too far ahead otherwise I fall into what is called Anticipated Grief--which anyone who has experienced can tell you it feels like a shock to the heart while being fitted with lead boots. Anticipated Grief is the overwhelming knowledge that someone we love is dying and one day very soon they will be gone-forever. It is very easy to get caught in AG and feel so overwhelmed that one cannot function and then it steals away precious seconds and moments we still have left with our loved one. It takes a lot of energy to stave off Anticipated Grief. And no this is not denial...it is the recognition I will have the rest of my life to grieve Les once he is dead; I will not allow myself to get lost in grief now while he is still here by my side. It means we take every opportunity to laugh. "The U.S. is such a big place, you've got the room for rubbish. It could all be dumped in a giant canyon somewhere for years and then sealed over with topsoil once the canyon was full." "Well," I replied, "I have always thought it would be a good idea to simply dump all the garbage in an active volcano--instant incineration." "Yeah but how could you get close enough to a live volcano to do that? I don't think that's possible." "Why not? There are ancient cultures who got close enough to active volcanoes to sacrifice virgins in order to ensure a good crop. If they could get close enough to throw someone in then I think disposing of our garbage via volcano is possible." At this point Les got the most amazing look on his face--half wistfulness and half regret. "What a terrible waste of a virgin." I laughed so hard my sides ached and Les had tears in his eyes as he took on a broad New York accent and called out, "RED HOT VIRGINS!! Get your red hot virgins here!!" from where I was woken out of a sound sleep at 4:30 am by Les sitting straight up in bed--still asleep--and yelling, "Get down off the roof Jaq!! Now before you fall!" With my heart banging in my ears I cried out, " For Gawdsake Les I'm not ON the roof--I am lying here in bed right next to you! "Les opened his eyes, looked at me and we both burst out laughing; it was so obvious Les' dream was fueled by our bedtime conversation the night before. It means that while we have always been in sync with another from the first week we spent together back in 2010 at Cloudhouse in Pullman, Washington, we are so deeply in sync now that we are literally reading each others' minds throughout each and every day. I think something and Les says it; Les thinks as he empties his stoma bag in the bathroom "Oh I need to write orange air freshener spray down on the grocery list" at the very same moment I pick up a pen and add it to his list. We have always had these little moments but now they occur several times a day, every day. It means we hold each other and weep when our hearts are too full to contain our emotions. "Look baby, the Harvest moon is rising." Les leaned over so he could see it and as he looked out the bow doors his shoulders began to shake. He was crying, overwhelmed by the beauty of the moonrise. "Why does it take death to make us appreciate the beauty all around us? I never really looked at the moon like this before and saw how really beautiful it is." Tears splashed his cheeks as I held Les in my arms and cried with him, thinking, "How many full moons does he have left to see?" It means Les has drafted a list of boat projects he wants to do as longs as he feels well enough to keep working. Les has always enjoyed working with his hands and building things. His dad was a coach builder back in the days when buses were constructed around wooden frames. He used to bring little Les to work with him and Les learned the pleasure of working with wood and building things to last at his father's knee. Of course this also means Les tricked me recently by asking me what things I would change on the boat after he was dead and gone. I thought he was asking out of mere curiosity. I didn't take into account he might had an ulterior motive. "Well, I want to tile the galley counter tops and replace the kitchen sink, and I want to do the same thing in the bathroom." Both projects seemed like something I could tackle on my own with a modicum amount of assistance. Suddenly both items have been added on to his current project list. Cheeky Sod!! That list is long and some days I feel like we live in a permanent construction zone. Of course, such a list means that we have to make frequent forays out into the world at large for parts and supplies and I have to ensure Les doesn't overdo things--which can be tantamount to asking the world to stop spinning for a day, but Les gets such obvious pleasure and satisfaction out of each job. He also tells me, "Jaq darling, I just want to do as much for you as I can while I can still do things. I want to know I left you in good shape with the boat and all is the way you want it to be." A lump rises in my throat and I get tears in my eyes as I look around at all the lovely things Les has done to this boat for me over the years: moving the fridge from the floor to the top of the galley counter, plumbing in the washing machine directly to the boat's hot and cold water system, building book cases for my books, and pull out drawers in the galley for my pots and pans; mounting a spice rack above the kitchen counter and a knife magnet on the wall; making slim, stylish dish and glassware cupboards out of Ikea Billy bookcases; extending our bed from 4 feet wide by 6 feet long to 6 feet by 6 feet; sourcing the foam padding for the extra mattress extension, installing sliding baskets into the wardrobe cupboard where the washer used to live, for clothes storage, building a new larger medicine cabinet in the bathroom and installing a composting loo--all this Les did out of love for me. Buying and installing a new TV with up-to-date technology (Les swore HD could not possibly make any difference in the clarity of the picture. Now that we have replaced our twelve year old, 15 inch, non HD telly and separate Freeview Box with a new 24 inch, Hi Def, digital unit with a built in DVD player, Freeview and wireless, Les cannot stop staring in delight at the picture! We are both looking forward to streaming movies directly from Netflix on our TV instead of our computers. Replaced the galley drawer and cupboard knobs with lovely new brass cup shaped drawer pulls that don't catch my pockets and look gorgeous! What is left on Les' Self defined Honey Do list? Purchase stainless steel T studs and have them welded to the bow of the boat so I can reach them to moor up. Les is over the moon about how much he can still accomplish. He just said, "I am so chuffed Jaq. I can still do a lot as long as I rest in between jobs and I'm having so much fun doing all this. "He doesn't stride along anymore, he shuffles now, but he still gets from point A to point B.
I wouldn't want anyone to think all Les does is work, work, work. We have purchased advance tickets to three matinee movies at the Rex Cinema in Berkhamstead. We've seen Jason Bourne and Eye in the Sky which was riveting! We will see Dare to Be Wild and Eight Days a Week next month. We've sat out at our little bistro table on hot, muggy evenings and enjoyed delicious ham sandwiches, fresh fruit bowls and homemade Brownies; we took a bus into town to have a mooch around and Les treated me to another al fresco dining experience with a picnic lunch from Wenzel's bakery. We sat on benches in the shade and ate sandwiches on lovely brown bread, with crisps (potato chips) and Carrot-Orange juice before hitting Clas Ohlson and Lakeland for bits and bobs. It means we have trips planned: three days in London, using our Avios points, in December when the boat is blacked, and if we are both in decent shape perhaps a seaside trip somewhere. It means we grab life by the fistfuls and gobble it up in laughter and tears. It means we make the most of each amazing moment we live because we know now how truly precious each moment is for us. A little medical and continuing the original cruise. So after all the talks of Stanmore Orthopaedic getting involved and waiting on records of just what amount of radio therapy I had back in 2013 it seems that I can have no more as the limit was almost reached in 2013. As for Stanmore`s involvement they are reluctant to do a biopsy because of my reluctance to undergo chemo therapy treatment. So back home with MST prolonged release morphine sulphate tablets every 12 hours that seem to have the pain under control. Since being back I did get a bit adventurous while under this pain free umbrella and ventured out two days running and ending up in great pain with the result Jaq had to phone the 24 hour on call hospice nurses. Having noted all the relevant figures, of not just my MST but also the extra Oromorph consumed over the past 24 hours, within 10 mins the exact dose and timing was relayed to Jaq and within an hour calm was restored. This was followed by a visit the following day from a hospice nurse who was also a prescribing nurse, and I always thought only doctors could prescribe drugs. After a phone consultation with a consultant at the hospice the prescribing nurse decided to slightly increase the MST and put me on Steroids for a short time. All I can say is it has been a 100% success with my feeling pretty much wondering if this 6-12 month prediction of my life expectancy has any foundation. Anyway just have to take it as it comes and I have no doubt Mr Cancer is working away in the background however good I might feel. Back to the cruise that had to be terminated, just like me, and we have turned onto the Trent and Mersey at Fradley junction. Still no sign of bad news at this point. This was an ex British Waterways maintenance boat that has become home to someone. 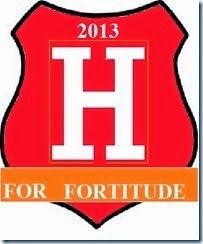 Hope it gets raised and drys out for them. Spotted on the long term moorings at Spode House. The view entering Rugely is pretty much dominated by the power station. It has just recently closed down with the loss of 120 jobs. Not only will the job loss affect Rugely but the power station was the councils biggest business rate payer and this will have a big impact on the town. At present it`s a very depressing place to walk around with many empty shops and a very large collection of charity(thrift) shops. This is bridge 66 giving access to the town centre and for boaters the Morrison's supermarket. With the road over the bridge closed you can sleep without the constant cars sounding their horns and as you can see Morrisons just a short distance. Now from the bridge in the other direction you have Tesco open 24 hours. Still even with no jobs the residents of Rugely still have to eat. Personally I always look on Rugely as a stop for Food and a mooch around the charity shops for books. 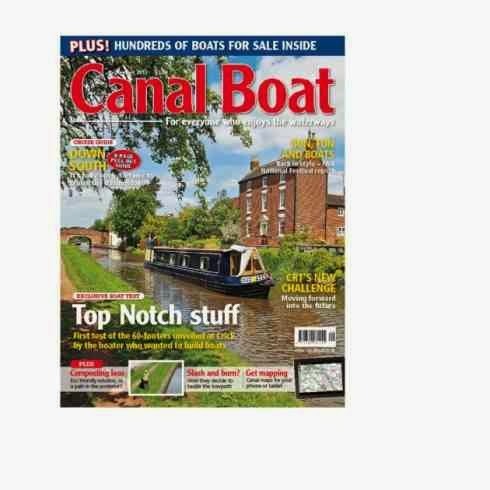 Also decent bus connection for Lichfield that has reasonable shopping and the Cathedral plus a short walk out of town, or the bus passes on it`s way into town, the work going on for the Lichfield canal at Borrowcop locks canal park. Worth a visit on the way into town as it`s just a 15 minute walk into the town centre after a walk along the restored sections. Cannock Chase over to the left, after leaving Rugely behind it`s nice to be back in open space. Never bought diesel here but it has always looked closed, perhaps tying up and sounding the boat horn would bring service. Maid of Oak made at Jim Bates yard on the Aylesbury arm off the southern grand union. I`m wondering if this was the first wooden narrow boat built since the last carrying days. Back in the countryside and they trust you to put your money in the box for your eggs. 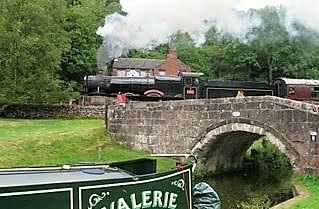 Now heading towards Great Haywood and the Staffordshire and Worcestershire canal to spend a few days of relaxing and giving what we thought at the time was a very severe back problem. Having tried an Osteopath back in Hinkley Jaq was looking ahead to find another or perhaps a Chiropractor. Penkridge was some 10 miles ahead and about 6 locks so a good rest and hopefully between us we can find a solution there. Mid May saw us going down the Atherstone flight heading for Chester still with my aching back pain that had by this time caused me to stop blogging and seek help from Chiropractors to no long term avail the reason we now know being the cancer. Jaq is doing a lot of the locks to ease my pain but at this time as you can see from that lovely happy glow cancer marching on into my bones is far from our minds. while others have progressed and mum acts as taxi service to two of the six young ones. After spending a few days in one of the longer pounds lower down the lock flight we moved on to Bradley Green services to use water and the rubbish disposal services. This is the site of Pooley Hall colliery wharf that was constructed in the late 1890`s. It was also connected to the main railway line at Polesworth. in the 1950`s it joined up with other nearby collieries to become the North Warwick colliery. From 1847 when a mine was first sunk on the the Pooley estate to the closure of it all in 1965 the canal played a big part moving coal. This is Alvecote marina and the Samuel Barlow freehouse pub. Just a little further on from here past the marina the canal narrows where a bridge once stood, probably the rail line into Amington colliery. The map below showing the basin and marina is from the early 1920`s. If you tie up by the old bridge hole you can walk in the basin that is not to hard to find just off the towpath. Five views of Streethay Wharf where we stopped for diesel. Proper working yard and always something to see. 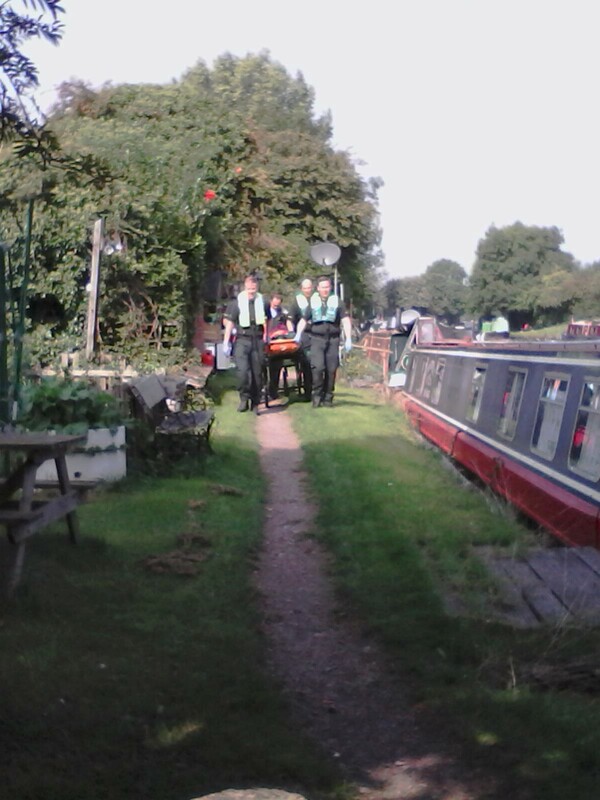 Last we exit from the Coventry canal onto the Trent and Mersey at Fradley Junction. The Swan pub it is said is one of the most photographed on the canal system. How anyone decided that I don`t know but with boats entering this junction through a swingbridge I guess plenty take pictures as they approach. I took mine from the towpath in front of the bridge.